Did you know that thousands of pets stray, become lost or are stolen every year? Many are never reunited with their owners. 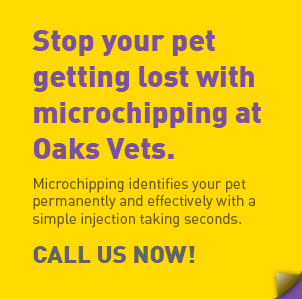 Make sure that does not happen to your furry friend, by having them microchipped at The Oaks. Microchipping identifies your pet permanently and effectively with a simple injection taking just a couple of seconds. The microchip is implanted at the back of the neck and contains a unique barcode number. If your pet goes missing and is taken to a dog warden, vet, police station or rescue centre, the chip will be scanned and the number checked on a microchip database to find your contact details. You and your pet can then be reunited. Microchipping became compulsory in 2016 for all dogs and we are offering low cost microchipping- £15.14 or £12.12 at the same time as neutering. For more information or book an appointment, please call or speak to one of our reception team.